FROM Kazungula to Beitbridge and across the rest of Zimbabwe, most people are familiar with the music of sungura maestro, Alick Macheso. For two decades he has been strumming his bass guitar passionately, ultimately developing a signature sound that is complemented by powerful lyrics. But if one crosses the borders or fly overseas, the impact of Macheso’s music is very minimal outside Zimbabwean communities, despite the fact that he is a big force back home. Sadly, the narrative is turning out to be the same for 35-year-old chanter, Winky D.
Known by many as the Ninja President, in over a decade that he has been in the game he has failed to get his music to appeal to an audience outside the Zimbabwean community. This was proven at the recently held 18th edition of the Harare International Festival of the Arts were he headlined the fiesta on Friday May 6 alongside South Africa’s pop band, Beatenberg. The latter took to the stage first pulling in a cosmopolitan crowd. When it was Winky D’s turn, he pulled in an even bigger crowd but 90 percent, if not more, of those who attended were local black folks and just a handful of whites. Locally, Winky D has upstaged several visiting international artistes — but that is where it ends. Those international stars he shares the stage with go on tour around the world while Winky D only flies out to perform to Zimbabweans in the diaspora. Only those who understand the language enjoy the song because the track’s magic is in the lyrics. It is the same case with most of his music. While Shona is relevant to the local audience, to a non-Shona speaking community it is not. Some might say; how come Tuku, Siyaya and Mokoomba are making it big on the global stage singing in their native languages? The answer is that those acts are musically on point, promoting Afro-beats, which are unique and sought-after — something which lacks in Zim dancehall. Most tracks follow the same mundane progression. Jamaican reggae-dancehall stars sing most of their songs in English and some in Patois. More people the world over can understand English hence they get to tour a lot. When African acts such as Stonebwoy, Patoranking and Shatta Wale adopted dancehall they did not sing strictly in their mother tongue but like Jamaicans they use more of English and Patois. Today they are continental shakers and are slowly turning heads on the global stage because when they adopted dancehall they took the total package. 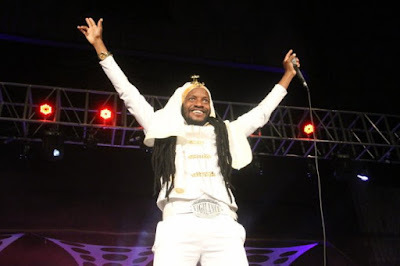 Winky D is not too far artistically when compared to the three aforementioned African icons. He has proved this on tracks such as “Green Like Me Garden” and “Rise Up Zimbabwe”. It is the consistency in producing such tunes for Shona laden sing along tracks which is hampering his breakthrough on the international market. Chimurenga music legend, Dr Thomas Mapfumo was heavily criticised by Zim dancehall loyalists when he said Zim dancehall artistes needed to follow in the footsteps of such greats as slain South African reggae artiste, Lucky Dube, and be recognised as reggae stars from Africa. To prove that Mukanya’s words are true, last year Patoranking performed at the Reggae SumFest, which is the largest concert festival in Jamaica, taking place each year in mid-July in Montego Bay, which is the same platform on which South African legend Lucky Dube performed. There is still a lot of work that Winky D and colleagues need to do to be able to perform on such a platform. The Ninja President was back in 2016 ranked amongst the top 10 Best Dancehall Artistes of All Time according to a list by ranker.com. Though many say it was a dodgy list — that is the biggest recognition he has ever received outside Zim dancehall Awards, ZIMAs and the NAMAs.